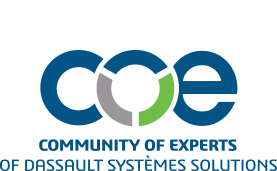 COE is the only community of experts of Dassault Systèmes solutions. By joining the COE Community you'll gain access to a host of resources that will help you succeed as a Dassault Systèmes solutions user. You'll have access to the Discussion Forums and the online newsletter COE NewsNet, and you'll receive announcements from COE regarding upcoming events, and Dassault Systemes news. Interested in Coporate Academic Sponsorship? Learn more. Download Printable COE Corporate Academic Sponsorship Flyer!